Herbert George Wells was born on the 21 September 1866 in Bromley, Kent. Called “Bertie” in the family, he was the fourth and last child of Joseph Wells a former domestic gardener and at the time a shopkeeper and professional cricketer for Kent and Sarah Neal a domestic servant. A defining incident of young Wells's life was an accident in 1874 that left him bedridden with a broken leg. To pass the time he started reading books from the local library, brought to him by his father. He soon became devoted to the other worlds and lives to which books gave him access; they also stimulated his desire to write. Charles Dickens was one of his favourite authors. Joseph Wells had an accident that left him with a fractured thigh. The accident effectively put an end to his career as a cricketer and his earnings as a shopkeeper were not enough to compensate for the loss forcing him to apprentice his sons. Aged 12, Wells wrote an illustrated comic book The Desert Daisy. Attended Thomas Morley's Commercial Academy in Bromley. H.G. Wells served a series of apprenticeships in drapery shops in Windsor and Southsea and a pharmacist in Midhurst. Became a teacher/pupil at Midhurst Grammar School in Sussex. He won a scholarship to the Normal School of Science in London [now Imperial College, London] where he studied biology under Thomas H. Huxley, one of the most influential scientific thinkers of the Victorian age responsible for popularising Charles Darwin's theory of evolution. However, Wells’ interest in his studies faltered, and in 1887 he left without a degree. Taught in North Wales, and then London. Teacher at Henley House, where he taught A.A. Milne, the creator of the Winnie-the-Pooh stories, proving his star pupil. 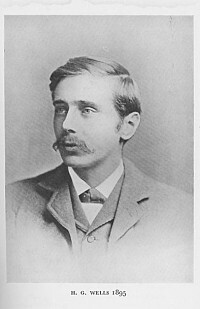 Wells returned to study to gain a London University B.Sc. Hons. degree in zoology and geology plus a teacher’s diploma. Wells settled in London, married his cousin Isabel Wells and continued his career as teacher in a correspondence college. In 1893 illness forced him to give up teaching; decided to become a professional writer working initially principally as a journalist. Wells left Isabel for one of his brightest students Amy Catherine,known as “Jane”. Divorced Isabel; following a further bout of ill-health in May 1895, Wells, aged 28, moved to Woking, he was still a new young writer making his way in the literary world. His first science fiction novel, The Time Machine, was published soon after his arrival in Woking. He married Amy Catherine Robbins in October 1895. See Panel on Wells in Woking for more detail about his stay in woking. Moved from Woking to a larger house in Worcester Park, Surrey during late Summer. Moved to Beach Cottage in Sandgate, Kent for health reasons. While living in Sandgate he moved to two further houses overlooking the ocean, namely Spade House (designed by C.F.A. Voysey) and the house in Castle Road. His two sons George Phillip (Gip) and Frank Richard were born while living here. As well as the improvement in his health, the family’s stay in Sandgate was generally a happy one and Wells and his sons would invent war games that were played out on the floor. Wells even found time to explain the rules in two booklets called Little Wars and Floor Games. His first visit to the US took place in 1906 where he met President Theodore Rooseveldt. He was also active in the Fabian Society during this period. Wells’ daughter Anna-Jane is born to Amber Reeves in 19090, daughter of associates of Wells in the Fabian Society. Wells became the first president of the Royal College of Science Association (an organization he helped to set up) in 1909. He leaves Sandgate in 1909. At the outbreak of war Wells was involved in a love affair with a young journalist Rebecca West, 26. His son Anthony West is born from Rebecca West. Death of Jane, his second wife. Having lived in Central London throughout the Second World War, Wells died in Regent’s Park, London on the 13 August 1946, aged 79.